How many people wait for the Devon Ice Rink to be set out as soon as the cooler weather hits? The wait is not necessary anymore. Blazers is open seven days a week, all year ’round. The Blazers Ice Centre has an ample and smooth skating rink. Unlike the Devon Ice Rink, this rink is smooth on every surface and angle. There are no chunks of ice on the sides possibly causing those who are skating to fall. Blazers offers two types of skates to choose from: hockey and figure skates. My personal favorites are the figure skates. They are less bulky than the hockey skates and are more comfortable on my feet. However, you decide which will work best for you. After all, there are two options versus one from the Devon Rink. Everyone seems to have fun at the Blazers Ice Centre. One can see friends skating and laughing at each other because one of them cannot skate. If this is embarrassing for anyone, let me tell you, upon my visit there was a 2-year-old boy skating like a professional. The boy would skate around the rink, spin in a circle and continue skating. 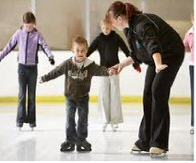 Blazers offers group lessons and classes for those interested in learning how to skate. Their activities consist of ice skating, ice hockey, figure skating and broomball. They also can host private parties and corporate events. Their amenities include a pro shop, skate rental and a snack shack. Unfortunately when I visited the snack shack was closed. Therefore I cannot say if they have good tasting food or what type. Admission is $7 for ages 7 and up, and $3 for ages 3 and up. Skate rental is $3 unless you provide your own skates. The Blazers Ice Centre is open for public skating noon to 2:45 p.m. on Monday, Tuesday, Wednesday, Thursday and Friday. They offer Family Night from 7:15 p.m. to 8:45 p.m. Tuesday nights. Additional time is added to public skating, starting at 7:30 p.m. to 10 p.m., Friday and Saturday. On Sunday the hours are 11 a.m. to 2 p.m. Please visit www. blazers-icecentre. com for more information.